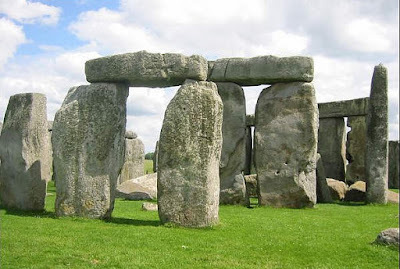 Interlocutor: … Moving on to another topic, What is the mystery of Stonehenge? Johnakan Ur-El: The stones were all placed there by extraterrestrials, those who are also responsible of the crop circles in the fields of England. Interlocutor: But what was the reason? At least the crop circles continue appearing? Johnakan Ur-El: The stones of Stonehenge were simply signs... There was an extraterrestrial civilization that got lost and they left signals so that they could be located. Interlocutor: of what age are we speaking? Johnakan Ur-El: We are speaking of centuries and centuries ago, the same as the circles of England. Interlocutor: Are these stones signs for UFOS that come to Earth then? Interlocutor: Then the megaliths and the circles related to the figures of Nazca, that is to say, all the drawings or monuments are location signals for aliens that come to our planet? Johnakan Ur-El: That’s right; they are mere signs to guide them. Interlocutor: Well, Master, the point was sufficiently clarified... Now I want to talk about that group of megaliths in England called as Stonehenge... Was it remodeled recently like they say? Ruanel: Yes, it was remodeled. Interlocutor: So it is no longer how it was originally? Interlocutor: What were these stones originally? Ruanel: They are similar to the crop circles, that is to say, marks or extraterrestrial signals. Each extraterrestrial race has a code and those stones represented the fact that that race was there. Interlocutor: Is it something like what the U.S. did when they put their flag on to the Moon? Or like when those that climb a mountain leave a sign or warning when they reach the summit? Ruanel: Exactly. In fact, it doesn't stop being something childish. The aliens don't simply leave inert symbols, but something more vital; because those stones or the same circles in the fields are equivalent to an entire code of messages for other extraterrestrials of the same race that eventually arrive to the Earth. Interlocutor: And all what was said of those ruins that were attributed even to a druid temple, and that they were also used for human sacrifices? Ruanel: Those stories are no more than fantasies originated in the exacerbated imagination of some terrestrials. Stonehenge doesn't have more history than the one I have just told you. All that is said outside of that is nothing more than an invention. This entry was posted at Thursday, July 02, 2009 and is filed under Mysteries and Enigmas . You can follow any responses to this entry through the .